It’s that time of the month again! (And I mean that in a good way!) Not only is it a new month, but a new year! Happy 2019! Here’s to hoping it’s better than last year! So far it’s off to a good start, there are great games releasing this month. Let’s chat about a few! If you are an older gamer and like horror the chances are high that you’ve played a Resident Evil game or two in your life. Even if you haven’t, you may have seen some of the movies. Well, they have re-imagined Resident Evil 2 because it was released over 20 years ago and sold almost 5 million copies. The game was bloody, scary, and had horrible graphics (not for the time, just for now). The new re-imagination looks amazing and you can watch the trailer here. They have what they are calling an immersive camera that is supposed to let you “feel” it when you get bitten, plus there is tons of detail put into Raccoon City. If you love Resident Evil as much as I do, this is a must get. Even if you’ve never played it or watched the movies, it should be on your list if you are a horror game buff! I’ve personally never played a Tell Tale game, but I hear they are wonderful. Many people know they are having some issues with the company, but it seems they are bent on finishing what they started. Episode 3 is following Clementine and takes us 75% through the story for this season. Zombie games are one of my favorite things and the ones in The Walking Dead TV show are pretty fast, so if they are the same in this game you better make sure you have running shoes on! If you enjoy Tell Tale games or The Walking Dead in general this is probably a great game. I grew up in the 90s and some of my favorite memories are of playing Super Mario Brothers, so while I don’t even own a Switch, I am super excited for this. This new game is a 2D Platformer that you can play solo or with up to 4 player. There are five different characters to choose from – Mario, Luigi, Toad, Toadette, and Nabbit. Now, if you are one of those people who thinks these games are too easy there are three extra challenge modes in this game to appease you! I don’t think you can ever go wrong with a Super Mario game, and I highly recommend you check it out! This is the game I am most excited for (even though I can’t get it because I don’t have a console /cry). I have played Kingdom Hearts from the very start and found it fascinating. If you are a gamer and a lover of all things Disney and you haven’t played this.. GET IT! I highly recommend starting from the beginning, but rumor has it you won’t need to do that to follow this new story. We will go to magical worlds like the 100-Acre Wood, Pirates of the Caribbean, Frozen, Tangled, and even Monsters, Inc! It took YEARS for this game to come out because they wanted it to be amazing and I have very high hopes. The game play looks beautiful and the characters make you fall in love with them. That’s all for this month, but there are plenty more games coming next month so stay tuned! And as always, ’til then, play what you love! Posted in Spotlight and tagged Disney, Game Releases, Kingdom Hearts 3, PC, Playstation, Resident Evil 2 Remake, Super Mario Brothers U Deluxe, Telltale Games, The Walking Dead: Final Season, Xbox. Bookmark the permalink. The 2 games I’m most excited about this month are probably not a big surprise. Everyone is excited about the upcoming Fallout 76 and if you are a survival buff like me then you are equally excited for Ark: Extinction. Just in case you aren’t familiar with these, let’s have a chat.. So if you have ever wanted an apocalyptic ga me, you probably have heard of the Fallout series. It starts with Fallout 1 that takes place in 2161 and the following games go all the way to 2287 in Fallout 4. Well, this time Bethesda is taking us back in time to 25 years after the bomb drops – in 2102. Only, it’s not just a prequel, it’s also a multi-player game! Fallout 4 takes us to the doors of the bomb shelters opening for the first time after the bombs drop and we can play with our friends in this new/old world that is the largest dynamic world in Fallout history. You can still play solo (for those who hate people), but if you choose to play multiplayer then there are no characters in the world that aren’t players and this sounds really fun. The price of Fallout 76 is the normal AAA price of $59.99 and up. If you want to see some video on it, check below. I’ll admit that I haven’t played any but Fallout 4, and thanks to a hard drive malfunction.. Not much of that. But, this looks like a ton of fun and I’d recommend it if you have the extra cash. So let’s start with the basics. Ark: Extinction is the third DLC for the base game Ark: Survival Evolved; which is a survival game set on an island, on another planet, full of dinosaurs. Be prepared to craft your own clothes, shelter, hunt for food, and survive the carnivores. This new DLC takes us back to where it all began, Earth. It’s hard to tell just how much time has passed because Earth is now a wasteland full of mutants, but it’s obvious this is the future because of the technology – and the new dinosaurs. Not only do we have mutated dinosaurs here, but also technological creatures to worry about. Not to mention, those mutated dinosaurs that have turned corrupted. These will always hunt you down if they see you, plus, they get pack mentality and can raid your base for the element you have gathered. This new world looks awful and amazing at the same time. There are new gadgets, like drones, that become available. There might even be crafting of your own “pets” if they decide they don’t want us taming the tech creatures. This is going to be the hardest planet to survive on yet, but you can always make it easier by taming yourself a Titan. Yes, a Titan. There are two confirmed so far – the Frost Titan and the Forest Titan; that are tamable! For a peak of what’s to come check below. If you don’t own Ark at all then you have to buy the base game ($49.99) first, but if you have it then Extinction is $45.99 (there is also a bundle). I would absolutely recommend this game for anyone who likes survivals. I have all the Ark’s and have not been disappointed yet. I mean there are mods upon mods to make the world what you want and even other maps and whole other play styles. Can be great for role-play as well. So, if you enjoy survival games or apocalyptic MMO’s then pick these games up this month! You can head over to buy Fallout 76 here or run over here for Ark: Extinction on Steam! Or head to your local game store for a copy! That’s all for this month, time to get looking at what comes out in December! Til then, play what you love! Posted in Spotlight and tagged apocalyptic, Ark: Extinction, Ark: Survival Evolved, Bethesda, DLC, Fallout 76, Gaming news, MMO, PC, Playstation, Steam, Survival Game, upcoming video games, Xbox One. Bookmark the permalink. When we talk about optimising your PC gaming experience, the first thing people talk about is usually upgrading your graphics card or processor. However, there is much more to your gaming experience than just graphics quality and frame rate. Sound is a huge part of modern gaming. If you’re playing your PC’s sound from a pair of tiny speakers, you’re missing out on a huge part of the gaming experience. Whether you’re listening for footsteps nearby in a first-person shooter or you’re watching and listening to a cinematic in your favorite Role-Playing Game, the quality of your games’ sound can change your experience. A good set of gaming headphones can improve your gaming experience by allowing you to feel a part of the gaming experience, and let you feel all the small nuances of sound that the developers put into the game. When you play PC games, you’re generally sitting in one place for hours at a time. It’s difficult to feel a part of your gaming experience when you can’t get comfortable in your chair. uncomfortable or developing aches and pains. Each person has different needs for a gaming chair, and it’s important to find the right chair for you. Whether you need a strong lumbar pad, a comfortable headrest, and armrests, or additional side supports, the right chair will let you play comfortably for hours. If you’re looking for a keyboard and mouse for gaming, you could always just buy a $20 office keyboard and mouse combination and call it a day. However, just as your favorite music sounds better through a quality speaker, your gaming experience will benefit dramatically from a high-quality gaming keyboard and mouse. Before you pick a keyboard and mouse, you need to think about what your needs are. Some people need all the extra buttons to assign to different actions on their game, while others are comfortable with a plain QWERTY style keyboard and a three button mouse with a scroll wheel. Think about your gaming experience and your needs, then be sure to try different styles. You will be able to find a keyboard and mouse that addresses your needs and feels comfortable. Your monitor displays the visual aspect of your games. Since graphics and frame rate has a large effect on your ability to feel a part of the game, you want to pick a monitor that displays your games in the best way possible. Full High-Definition, or 1,920 by 1,080 pixels, is the minimum requirement for most modern games. However, a larger monitor combined with newer games can allow you to reach resolutions as large as 2,560 by 1,440. Remember, the higher the pixel count, the clearer your picture. So if your gaming area has enough space, a larger monitor is usually better. Running games at full 4k is a stretch for most hardware at the moment, but investing in a 4k monitor could be a good future-proofing move. Your gaming experience should be comfortable, easy to use, and help to make you feel a part of the gaming experience. Making these simple upgrades in your PC peripherals will give you an entirely new gaming experience. OPSEAT is a leading brand of PC gaming chairs. Posted in Special Guest and tagged gaming chair, gaming keyboard, gaming monitor, gaming mouse, headphones, PC, PC gaming, set up. Bookmark the permalink. I’ve had Town of Salem for awhile now. I bought it based on a suggestion from Noah of +2 Comedy, as we were talking about my love of Werewolf the board game. Both are similar to Mafia. If you don’t understand anything I just said, that’s fine. I’ll explain. Town of Salem is a 15 player game. You and 14 other people form a town and you each have a role to play. Depending on what version of the game you play, you could be anything, but let’s talk about classic mode. I know that is a lot to take in, but that isn’t even half the roles in the game. So, you 15 are in this town and have one of the above roles. You either have to kill all the good guys or kill all the bad guys, depending on which side of justice you’re on. During the day, you have to convince the other townspeople of your innocence and another’s guilt or lie through your teeth to get someone else killed. During the day the town votes on a person to lynch and at night murder and mayhem happen. In the game, you are given tools. You have a Will that you can use to keep track of what you’re doing. If you are a jailor or an investigator, you can use this tool to record what it is you see or hear. By doing this not only do you keep a track of what’s happening but also, if you die, this is made public to everyone. Your second tool, if you’re a bad guy, is a death note. This can be useful, even if you’re evil. If you are the mafia and find someone is immune to killing attacks at night, they are most likely the Serial Killer. You can put that in your note, hoping that the town pays attention when you kill your next innocent and hangs your rival. Besides classic mode, there are several other play modes. My current favorite is Chaos Any mode. You have no idea what the roles are and anyone could be anything. I think the graphics are adorable. You have little avatars and houses that you come out of each morning. With coins, or cash, you can change your avatar, house, pet, method of death (I get struck by lightning) and even the playing arena. I love playing this game. I bought it on Steam for $5 and it was some of the best money I ever spent. Despite my love for this game, however, I can’t stand most of the people who play. Unless I am playing with a group of friends, I get annoyed very quickly. It boils down to the maturity of the people playing, really, and most of the time it’s low. A great deal of the time, people will leave if they don’t like their role or if they die they will abandon the game, which pisses off the medium. Fortunately, they seemed to put a cap on my biggest issue: the entire game would be filled with racist and sexist jokes. Thankfully, they put a filter on so it says something cute, like “tarnation,” when people are being douches. I’ve seen people get around it by adding spaces, but it is a step in the right direction. Of course, we are still left with people being idiots in game, so it makes it increasingly difficult to make proper deductions. This feels like one of the unfortunate things you will just have to deal with because, as we all know, playing online subjects you to all sorts of people. If you don’t have this game, you should. You can play it for free at BlankMediaGames.com or you can purchase it on Steam. Feel free to add me to your friends list! Posted in Review, Uncategorized and tagged Blank Media Games, Crymson Pleasure, Gamers, Games, Gaming, Mafia, PC, PC gaming, Real Women of Gaming, Reviews, Roles, RWoG, Steam, Steam Games, Town of Salem, Video Games, Werewolf. Bookmark the permalink. I recently purchased the game Banished from a Steam Sale and I was super excited because I love building/resource management games, even though they infuriate the hell outta me. I’ve been playing on the easier levels and, even at easier levels, I had to restart at least 20 times before I had a working town that would survive more than the first few years. 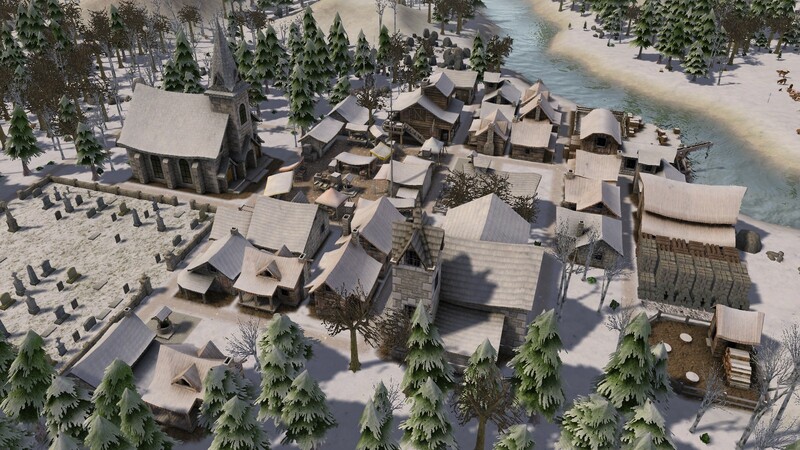 Banished has no real story. As far as I can tell this game is about a group of people who’ve been banished to this land and have to rebuild/start over. You have trees to harvest, iron and stone to mine, herbs to gather for medicine and food to collect. Posted in Video Games and tagged Banished, Computer, computer games, Crymson Pleasure, Gamer, Gamers, Games, Gaming, PC, PC gaming, Real Women of Gaming, Resource Management, Review, Reviews, RWoG, Steam, Steam Sale, Video Game Review. Bookmark the permalink. Awhile ago, I asked on our Facebook page if there were any blog posts that our fans wanted to see. One fan mentioned the representation of female heroes in video games. Considering that I made that post months ago, I’ve had a lot of time to think about it. I’ve kept it in the back of my mind. You see, this one particular thing stuck out in my mind so well for a very specific reason; a reason I haven’t shared with our fans or followers until now. Well, now I’m sure you are very curious as to that reason, so I’ll tell you. I’m 8 months pregnant and I’m going to have a baby girl. So, now I am sure you were going to go into this post with one mind set, but shift gears with me for a moment. I love video games, obviously. I have played games where the female character wanted to be a supermodel or an actress. She was the damsel in distress. She was raped at some point in her past. Funny thing is, I’ve never played a game where a male character wanted to be a supermodel, an actor, was in distress or raped in his past. Now, to point out how I think about it. I want to share my love and passion for this amazing art form with my daughter, eventually. As does her father. Do I want her think that the only way she can become a hero is if she wants to be a supermodel or an actor? That she needs to play the damsel in distress to win? I can’t even think of the last part. Posted in Women in Gaming and tagged Crymson Pleasure, Female Gamer, Feminism, freedom, Games, Gaming, PC, Real Women of Gaming, RWoG, Sexism, Video Games, Women Gamers, Women in Gaming, Women's Rights. Bookmark the permalink.